One of the items on the agenda of the APA is to discuss “matters relating to the global stocktake,” the collective moment of review every five years, beginning in 2023. Importantly, there will also be a facilitative dialogue to take stock in 2018, a process which could both provide some direction for future stocktakes and also be shaped by the emerging discussions about those stocktakes. Together, these moments to take stock are at the heart of what has become known as the ambition mechanism of the Paris Agreement, which is an ongoing process, intended to inform successive NDCs and strengthen action in a regular and timely way. The ambition mechanism, and global stocktake within it, is what makes the Paris Agreement dynamic, durable and responsive to the science of climate change, shifts in technology and economic opportunities, and to growing public support for action. However, as Parties take the first steps this week to elaborate the parameters of the global stocktake—specifically, to identify its sources of input and its mode of operation—it will be important to keep in mind the process as a whole, including the intended outputs and how they should influence future mitigation, adaptation and support actions. 1. What information should feed into the global stocktake? The global stocktake is an opportunity for all Parties to collectively assess what progress has been made towards achieving the purpose of the Agreement and its long-term goals. It should be informed by science, progress made in implementation, an assessment of how far is left to go, and what opportunities or potential exists for enhanced action. The COP has requested that the APA determine the specific inputs that could provide this information for the stocktake. One of the first steps that countries can take is to develop a list of existing information sources, including national reports, reports from UNFCCC subsidiary bodies and scientific inputs (i.e. the IPCC report on 1.5C). The Secretariat could be charged with compiling such a list, assessing potential gaps in information and requesting Parties to submit their views on the list. Parties might also want to consider how to incorporate information from other UN organizations and civil society. 2. 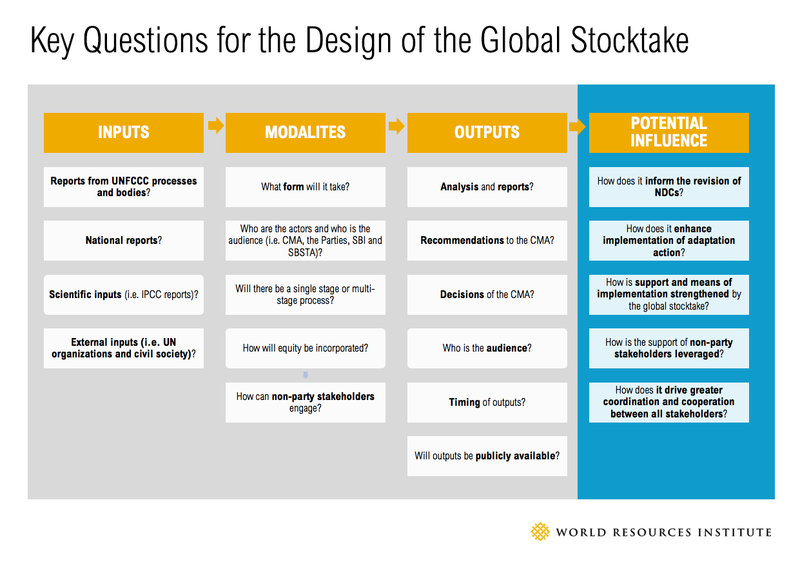 How should the global stocktake operate? The global stocktake is meant to be a periodic assessment of collective progress. It must be comprehensive and facilitative, and consider mitigation, adaptation, means of implementation and support. It must do all of this in light of equity and the best available science. The APA has been requested to develop the modalities (essentially the way that the global stocktake will work) in order to achieve this mandate. These modalities should be designed to enhance transparency, build trust and ensure accountability between Parties. This necessitates the creation of an open and transparent multilateral process that is focused on creating a shared understanding of Parties’ implementation efforts and the data and assumptions underlying such efforts. This prompts further questions about whether all Parties will be subject to the same process, whether political processes will be combined with technical expert reviews based on the inputs to the global stocktake (i.e. national reports), and how publicly available these reviews will be. These questions are complex and unlikely to be entirely resolved this year. How the global stocktake will work will also depend in large part on the inputs, outputs and influence it needs to have. It is important, therefore, for Parties to start thinking through these questions. 3. What should be the outputs of the global stocktake? Although the APA hasn’t been specifically requested to consider outputs, these will be a core component of the global stocktake. Article 14 of the Paris Agreement envisages the global stocktake informing Parties in updating and enhancing their actions and support and international cooperation for climate action. What outputs from the global stocktake would help achieve this? Such outputs could consist of analysis or reports, recommendations to the meeting of the Parties to the Paris Agreement from UNFCCC bodies and decisions of the CMA itself. When these outputs will be produced, whom they will be directed at, and how they will be made publicly available are also key questions. 4. How will the global stocktake assist in implementation and drive further ambition? The potential influence of the global stocktake must be front and center in any determination of the above components. The global stocktake should enhance implementation and drive increasing ambition from all Parties over time. The global stocktake must identify and unlock potential barriers to implementation, and connect countries with the support needed to overcome them in order to increase ambition. Ensuring the global stocktake can inform the delivery of support and technical assistance through the Financial Mechanism, Technology Mechanism and UNFCCC bodies undertaking capacity building is critical. The APA should also consider how civil society could engage with the global stocktake to maximize its influence, including opportunities to provide information, technical analysis or external assessments. These are big questions, the answers to which will only become clear after much dedicated time, thought and collaboration. The answers to these questions will ultimately propel the Paris Agreement forward, equipping world leaders with information about what has been achieved and what more needs to be done to create the zero-carbon, climate-resilient world envisaged. This is information the public desperately needs to hear.